A retroreflector passively returns a beam in the opposite direction from which it came. 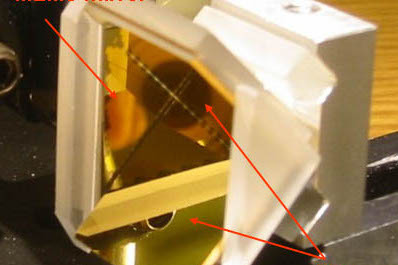 In free space optical communications, a retro-reflector can be used to recycle received optical power and automatically return it in the direction of the sender. In this fashion, optical alignment and tracking is only required at one end of the communication link while still maintaining bidirectional communication. The retroreflector encodes a signal onto the return beam by adding a modulator to the retroreflector. A commonly used retroreflector is the corner cube retroreflector which simply consists of 3 mirrors at right angles to each other. In our work, we add in its modulation capability by replacing one of the mirrors with a MEMS deformable mirror. This lets us subsequently deform and flatten one of the mirrors, thereby modulating the retroreflected wavefront. Our prototype achieved 10 kHz switching times with 2.4:1 extinctions over a 35° range of incident angles. This modulator demonstrated similar response over a wide wavelength range. T. K. Chan and J. E. Ford, “Retro-reflecting optical modulator using a MEMS deformable micro-mirror array,” IEEE Journal of Lightwave Technology, Vol. 24, No. 1 (January 2006), pp. 516 – 525. T. K. Chan and J. E. Ford, “Deformable MEMS Micromirror Array for Wavelength and Angle Insensitive Retro-Reflecting Modulators,” IEEE LEOS Annual Meeting, (paper ThEE4), Rio Grande, Puerto Rico, November 7-11, 2004, pp. 1007-1008.